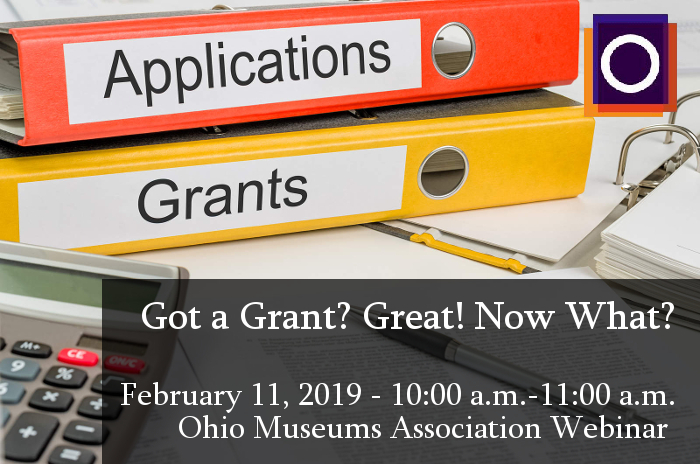 Join OMA for our February webinar, "Got a Grant? Great! Now What?" Join OMA for our February Webinar - Got a Grant? Great! Now What? Receiving a grant for your museum can be a gamechanger—making programs possible and getting projects off the ground—but writing the grant and getting the grant are only the first two hurdles you need to clear in the process. For museum staff without prior development experience, or those already wearing too many hats, grant management can be a daunting task full of unanticipated deadlines, and unmet expectations. Join Principal at Illumine Creative Solutions and OMA Past-President, Jennifer Souers Chevraux, as she shares the basics of grant management along with tips and tools for tracking the impact of the grant on your museum and the community you serve. This session is relevant for anyone at organizations of all budget sizes who writes grants, receives grant funding, or wants to receive grants in the future. About the speaker: Jennifer Souers Chevraux has 25 years of experience in the museum field, during which she has served as curator, educator, exhibits director, development officer, board member, and executive director at a wide variety of cultural heritage institutions. Through her company, Illumine Creative Solutions, LLC, Jennifer helps individuals, corporations, and organizations apply museum standards and best practices to manage their collections, reduce risk, prepare for the unexpected, and plan for a sustainable, intergenerational legacy.